Inline ‘Hydrosphere’ tanks mount directly on to the pipework. 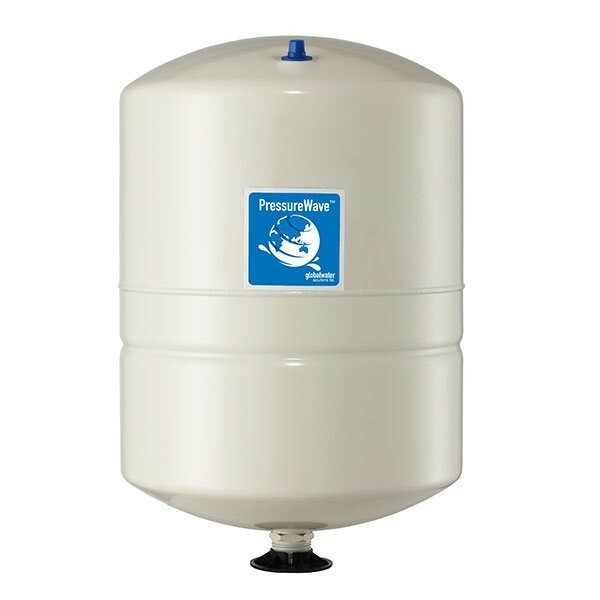 The PressureWave™ Pressure Vessel Series is constructed of a virgin polypropylene liner combined with an FDA approved high grade butyl diaphragm. This is held against the wall of the tank with a steel clench ring. The brass air valve, sealed by a threaded o-ring valve cap, prevents air leaks. Water enters the tank through a patented stainless steel water connection. The diaphragm and liner are both reinforced in specific wear areas for longer life. All internal parts including the air valve are rounded to prevent piercing of the diaphragm in extreme conditions. The water connection uniquely provides a dual water/air seal ensuring a complete leak free and maintenance free pressure vessel. On the exterior, the almond coloured two part polyurethane paint finish over an epoxy undercoating provides hundreds of hours of UV and salt spray protection. PressureWave™ tanks are quality tested at several stages on the production line to ensure the structural integrity of every tank. PressureWave™ tanks represent the best value for the investment and are the best quality pressure vessels available today. PressureWave™ tanks are ideally suited for a wide range of applications, including water booster systems, thermal expansion, irrigation systems and hydraulic hammer arresting.